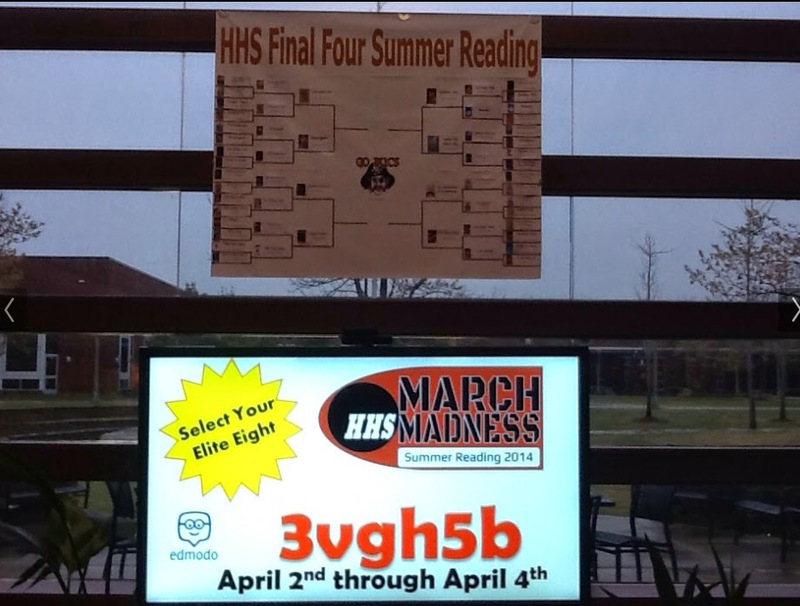 March Madness has flown by and we are now down to the Elite Eight. Ms. Crystal Camp has been the driving force behind this exciting reading initiative. 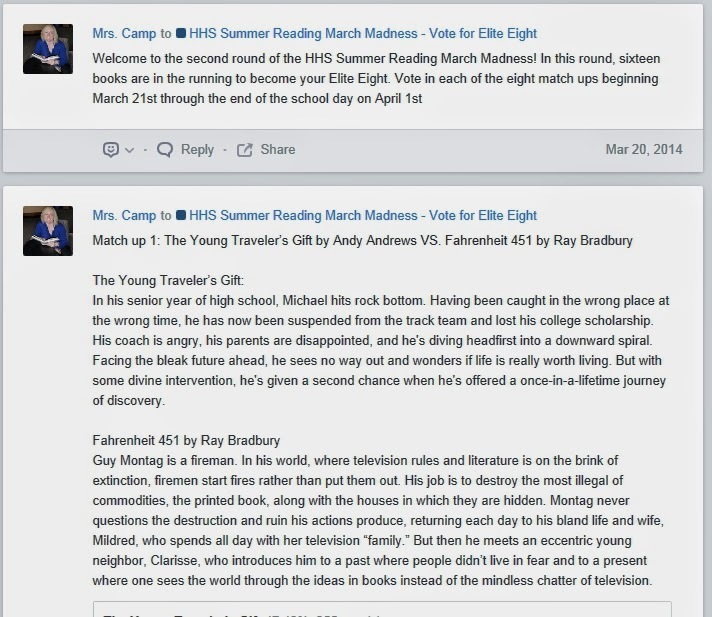 Students and teachers vote by joining the Edmodo group. 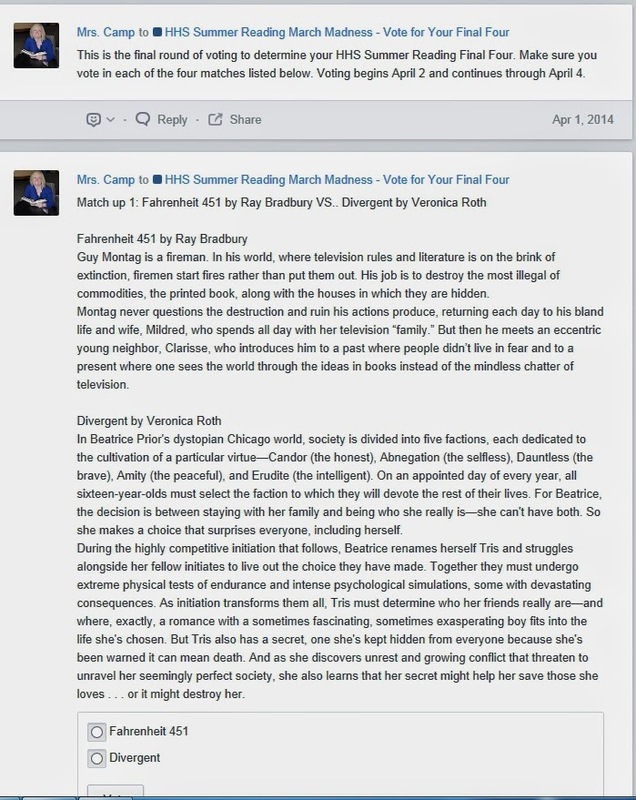 Ms. Camp posts book descriptions for each book pairing. To celebrate the arrival of Spring and the 45th anniversary of Eric Carle's The Very Hungry Caterpillar we planned a lesson around this treasured book. Ms. Robertson read The Very Hungry Caterpillar to students projecting the pages of the book from her iPad to the big screen TV via Apple TV in our beautiful atrium. 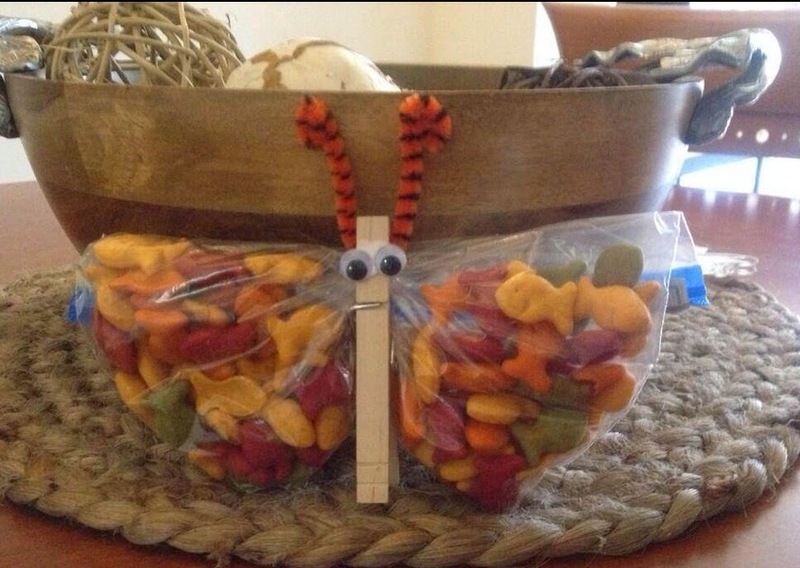 Students then transitioned to the library right tables where they made butterflies using a wooden clothes pin, a sandwich bag, beady eyes, pipe cleaner and goldfish crackers. This school year we stopped using the previous calendar system and started using Google Calendars to book shared spaces and resources. 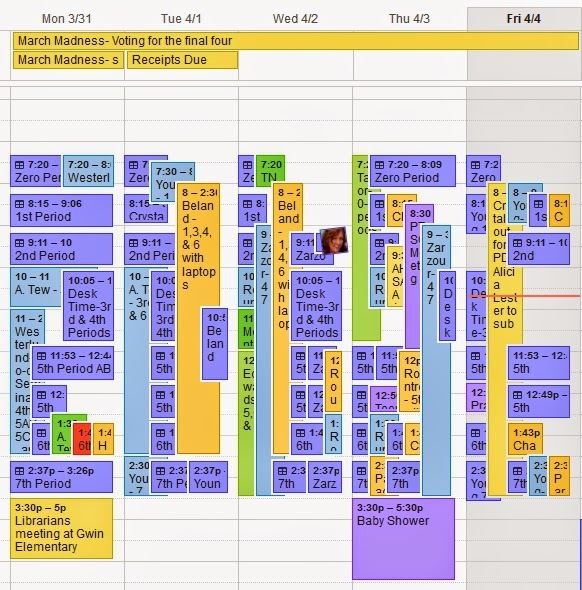 I only knew the basics of Google Calendars so it was rather tedious to view and make calendar reservations. 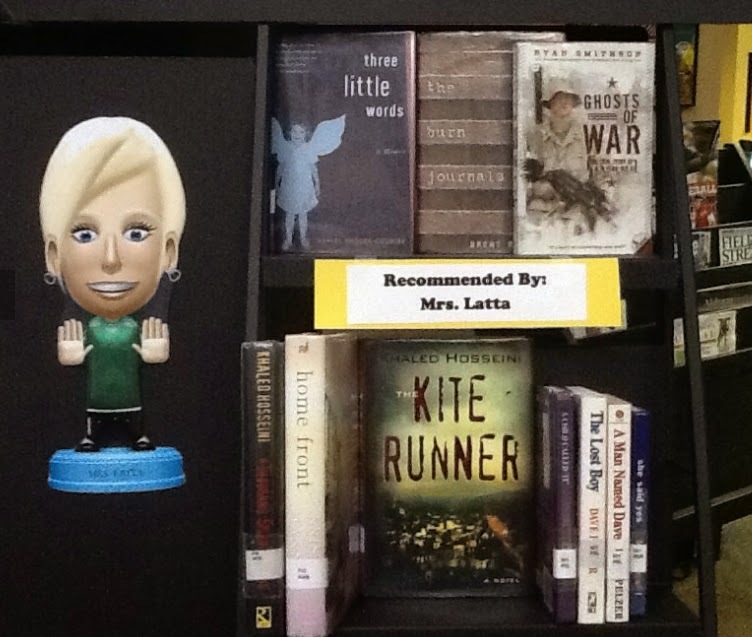 Teachers have emailed the library staff when a space or resources were needed. Over Spring Break I started taking the lessons to become a Google Educator (http://www.google.com/edu/training/certifications/). When I got to the lesson on calendars I was thrilled to learn how to not only share the Google Calendars with teachers but allow them to book their own time. I created a tutorial video and step by step picture directions for teachers to follow. So far I have had several teachers try it and they were SUCCESSFUL! Yay! It makes me want to do the Happy Dance! 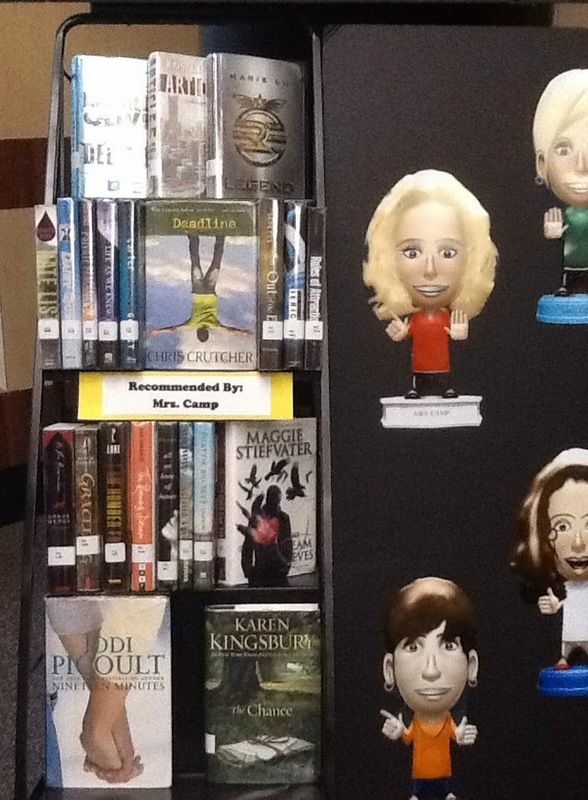 Ms. Camp created a new display that went up right before Sprig Break with recommended reads from the library staff. We had a fun time making the avatars and laughing at each other. 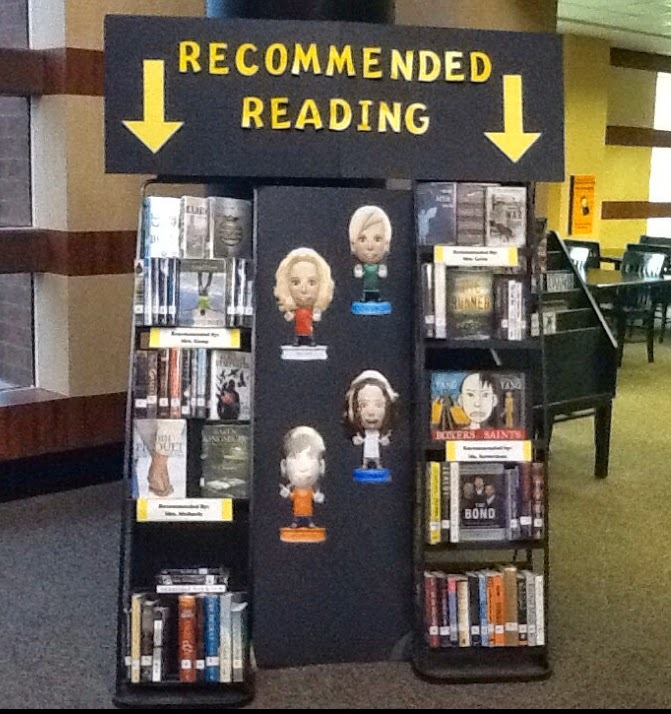 What would your recommended reads be? 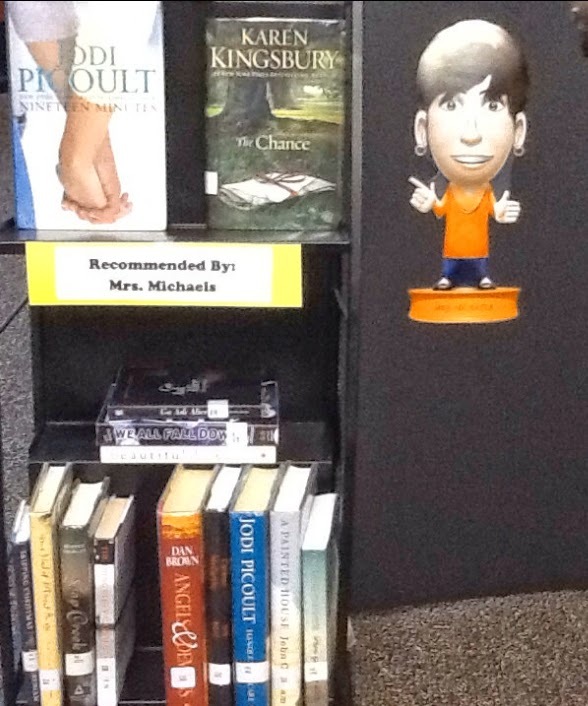 The Library@HHS was booked with teaching classes this week, which is one of our favorite things to do. Ms. Camp taught Mr. Beland's 1st, 3rd, 4th and 6th period classes how to use the Alabama Virtual Libraries databases to find Health Science related materials. 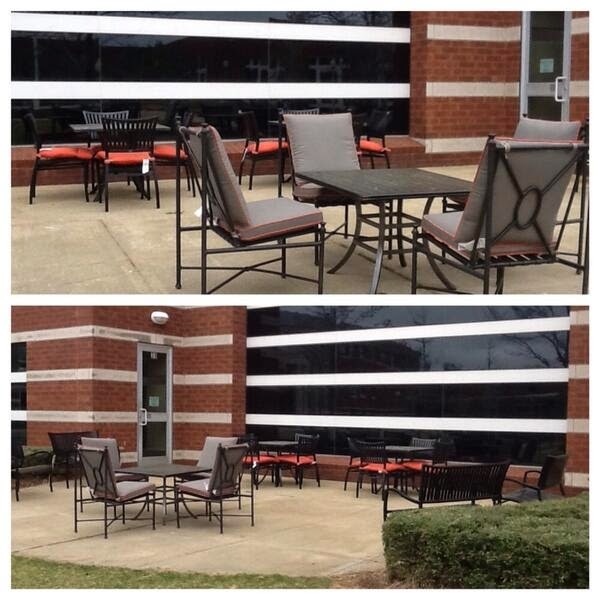 Our new Outdoor Classroom got two more benches and custom made cushions to match the decor of the library inside. The Library@HHS is extremely grateful to our generous PTSO for providing the beautiful space for our teachers and students to enjoy. Ms. Crawford and the Color Guard booked The Library@HHS (using the new Google Calendar directions) to use this weekend to watch a live competition. Ms. Camp and I both helped Ms. Crawford this week test her equipment to decide if using an iPad with the Apple TV or a laptop would work best for the event. 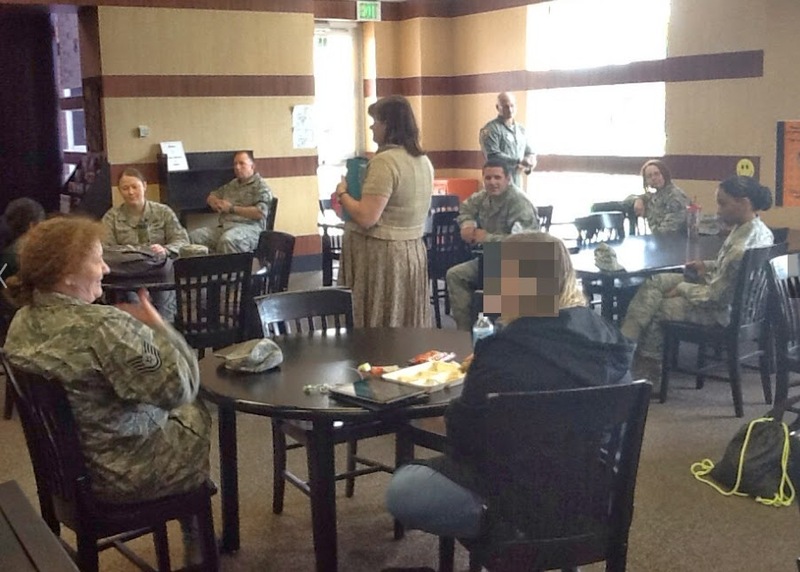 The 117th AirWing Refueling Battalion met with the students they are mentoring again this week. It is so great to see the relationships build and hear the conversations. 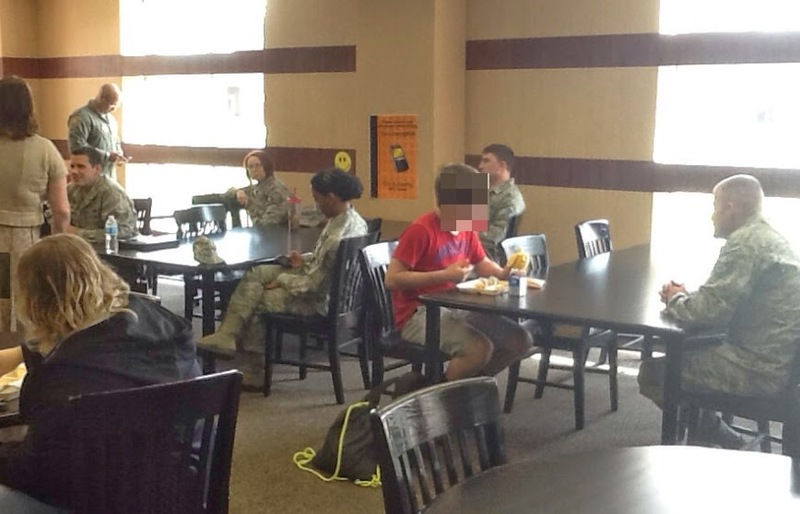 You can tell the students are truly happy to have an adult who is willing to take some time with them to just talk. The week ended with a fast, furious and fun rewindable learning lesson with Ms. Young's students. Ms. Young and Ms. Robertson co planned the big cumulative end of the year Event Planning Project. 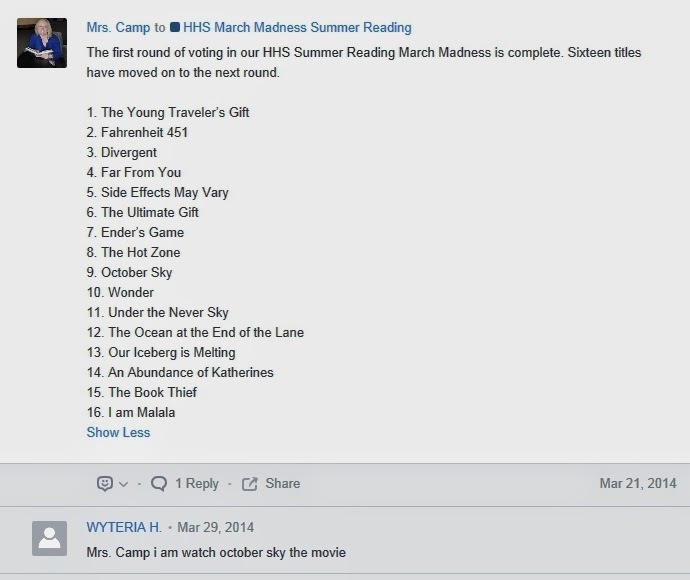 Together they decided students would use Google Drive, Canva or some other design template website, and BlendSpace to complete and turn in their projects. 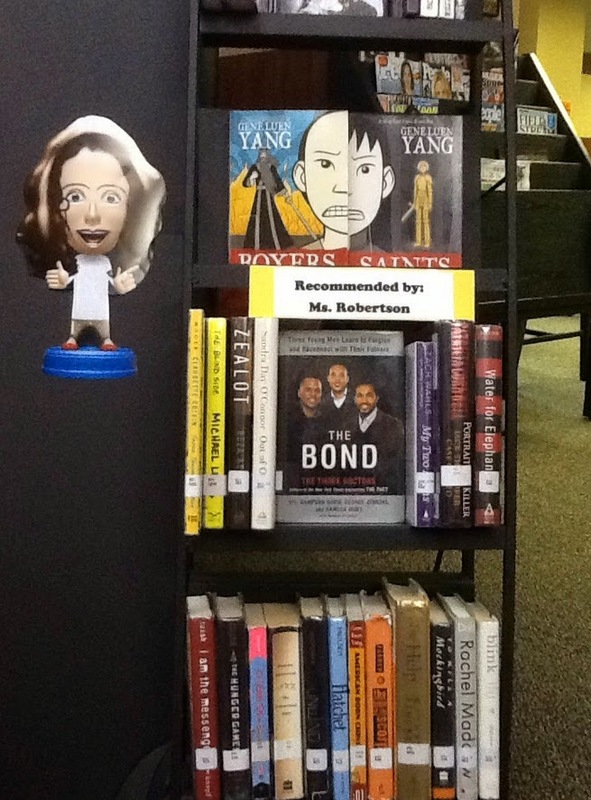 Ms. Robertson recorded the session and the details of the day can be found HERE. Next week will start of with a great session that will be broadcast LIVE via Google Hangouts On Air. Sponsored by Mr. Coltrane, AP and IB English students will host a guest speaker who will speak about his experiences in the Vietnam War in conclusion of the students having finished reading The Things They Carried. Watch for tweets so you can watch and learn too!